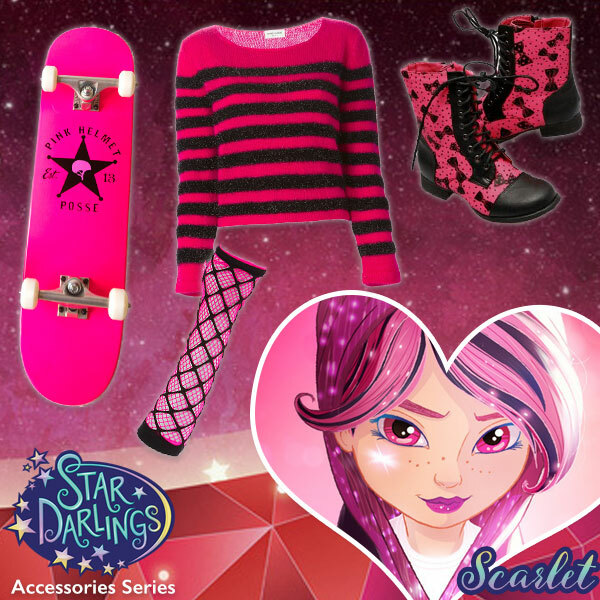 Star Darlings Accessory Lookbook | YAYOMG! 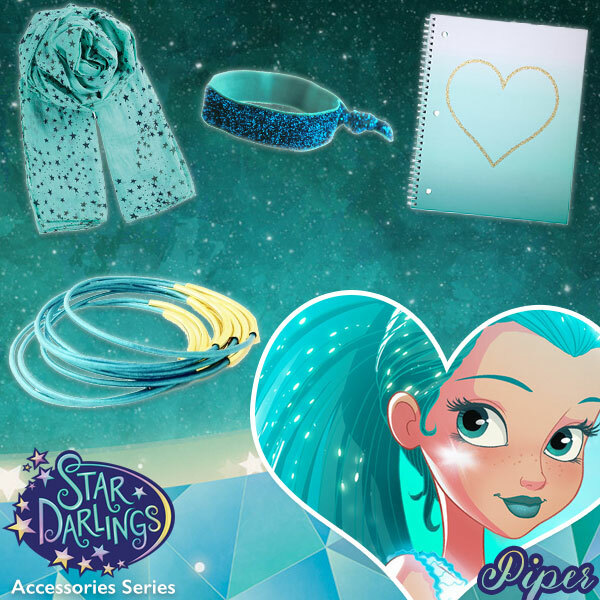 Being an aspiring fashion designer, you know Adora is down with some bold and flashy accessories, which is why we went for the blue bangle bracelets. They’re a great statement piece that will lift any outfit from boring to extraordinary! 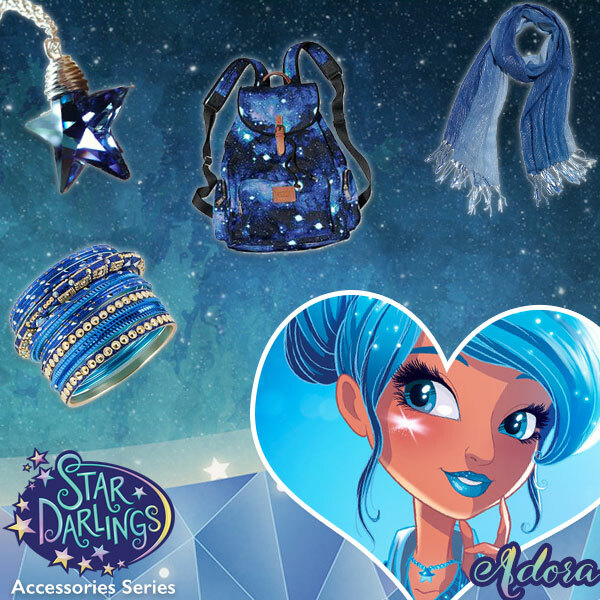 We chose a blue crystal necklace to match the necklace her character wears on the show and tossed in a fun scarf and a galaxy backpack. 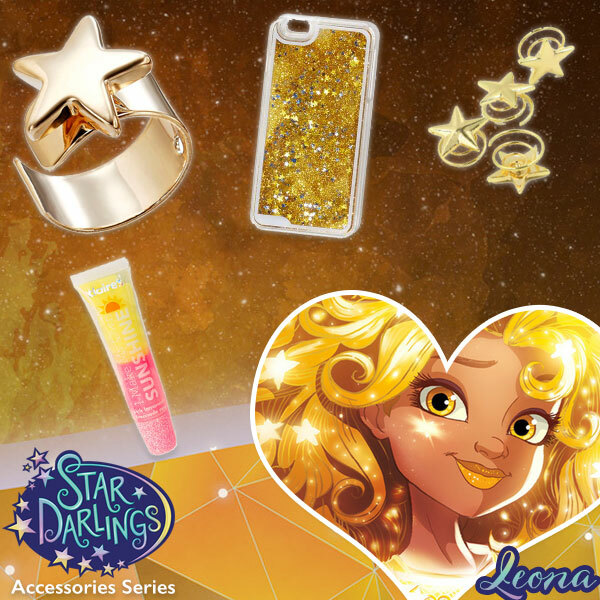 If you’re going for an Adora inspired look of your own, you might also want to try a blue star watch if you can find one, since that’s her Wish Pendant. 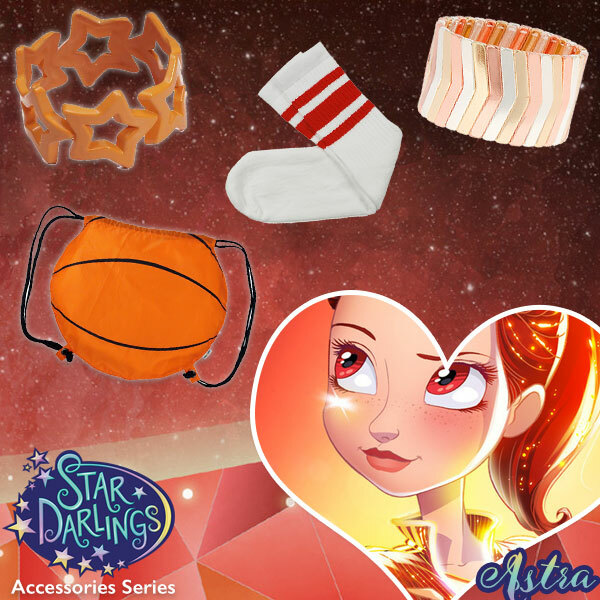 Astra is the star of the star ball team, so we went with a basketball inspired style for her. Red striped tube socks, just like the ones she wears. You could also go with orange, since she’s got that fiery passion! A chunky star bracelet, inspired by her Wish Pendant wristbands would go great with Astra’s look. If you’re not into basketball, you can swap the basketball shaped drawstring bag for a different bag of your choice. No biggie! 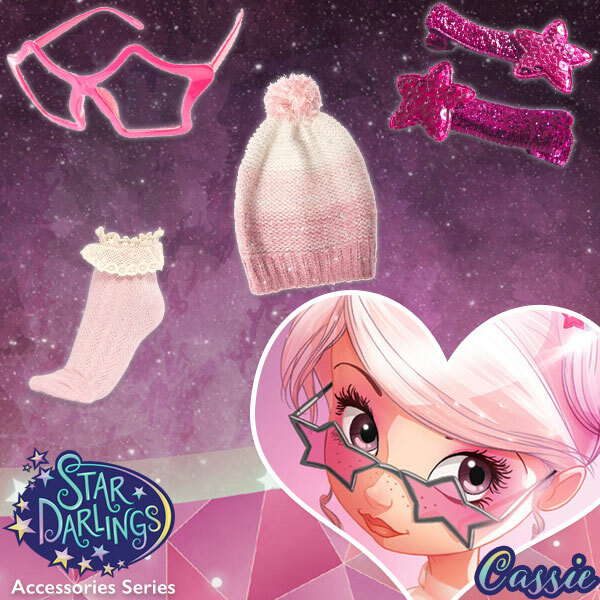 You can get Cassie’s girly pink style by going with a mix of baby pink and hot pink accessories. Cassie’s signature piece are her star shaped sunglasses, so you’re definitely going to want to try and incorporate those into your look if you can. She also wears insanely adorable ruffle socks which are a must have. Cassie’s hair is usually up in buns, but if you like to wear your hair down, this pink ombre beanie is a great alternative. 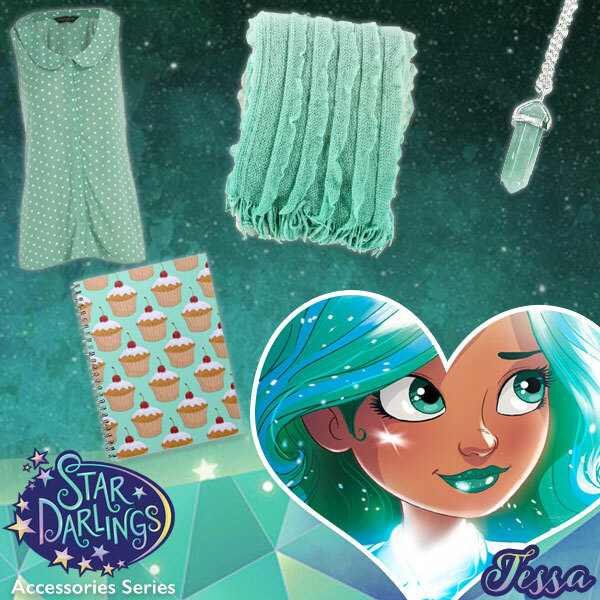 Add in some bright pink star hairclips, and you’ve nailed Cassie’s precious look! Now make sure to aspire after her super-smart brain, and you’ll have it all. It wouldn’t be a Clover inspired look without a great purple fedora. Since she’s a DJ, we chose some super glittery headphones that she might rock while spinning her outrageous beats. The amethyst crystal necklace isn’t exactly like her Power Crystal, but it’s so unique, it would be impossible to find something exactly like it. 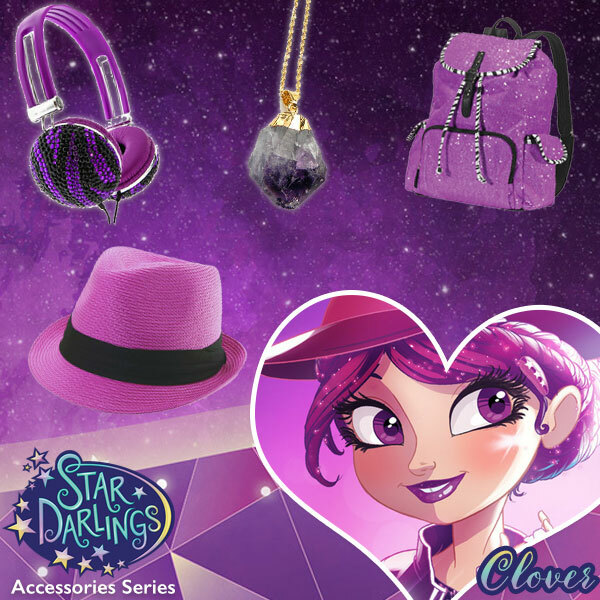 Toss in any other fun purple accessories you think might bring your Clover look to the next level, and you’re good to go! If you’re anything like Gemma, you’re popular, cool, and have great style. 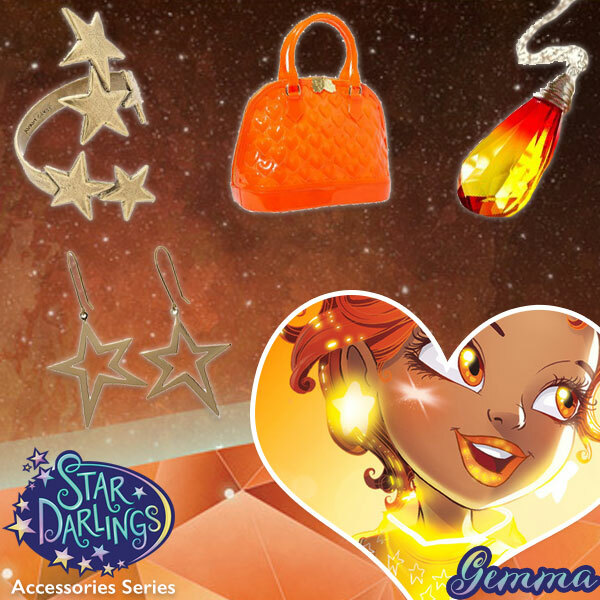 To get a look like Gemma’s, you’ll need a pair of big star earrings. Gemma’s glow, but yours don’t have to. She also rocks a really cool star cuff on her wrist, just like her sister Leona. Spice up the look with fiery colored accessories, like red and orange bags, crystals, necklaces, or anything else you’d like you. Whatever you choose, just do it big and bold like Gemma would! Leona lives to be the center of attention, so her style reflects that. She’s all sparkle and glow, which is why we chose glitter lip gloss and a starry, glittery phone case for her. It matches her diva side perfectly! Gemma’s big, wild hair is filled with glowing stars, and you can mimic that look yourself with little twisty star clips. Instead of a clip, they have a spiral so you can twist them into your hair and it looks like your hair is swimming with stars! Top off the look with her star wrist cuff, and you’ll shine just as bright as she does! If you’re going for Libby’s style, you’ll definitely want to get a big statement star necklace like hers. Being the student body president, she’s always organizing Starling Academy events and happenings, so we thought a glittery pink clipboard would be perfect for her. 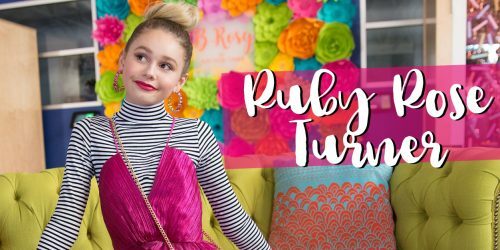 Getting in touch with her inner rockstar (since she totally slays on the keytar), we chose a sheet music hairbow and a pink sequin jacket that will really make you stand out! If your style is a little more low-key, a cardigan might be more your style. Piper is all about finding her inner zen. She’s a total yogi who loves meditation and writing poetry, so we thought a pretty notebook would be a great choice for someone trying to rock her style. It’s got the colors in her outfit, and it’s got a really peaceful vibe for writing down your innermost thoughts and feelings. Piper has a really pretty sash belt on her outfit, but since that’s not really a thing we wear often in the Wish World, we thought a scarf in a similar style might be a great way to interpret her look. 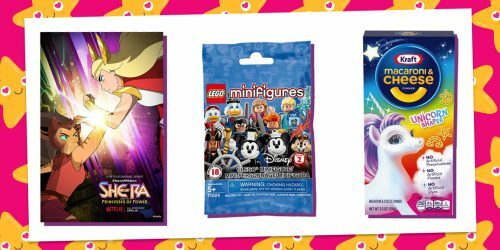 She’s always rocking a ponytail, so a sparkly hair tie is perfect if you want to put up your hair like hers – and don’t forget those bracelets! 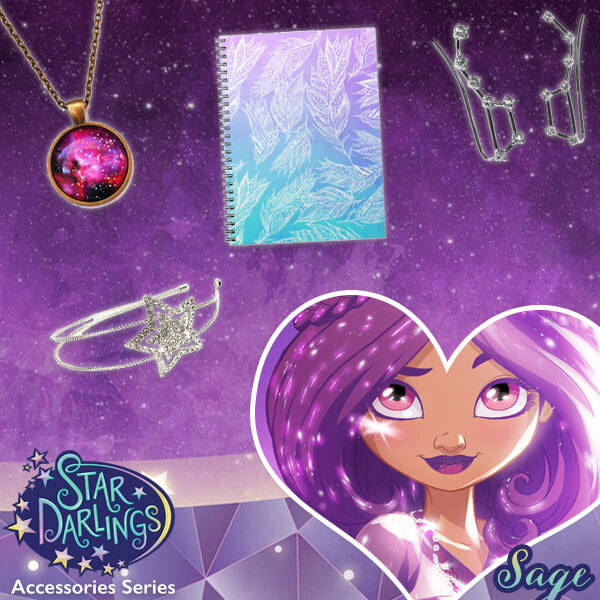 For Sage, we went with less of a copy-cat look and more of an overall “Star Darlings” inspired style. The stuff we picked for this look works great for Sage, but could also be mixed and matched for most of the other Starlings as well. The silver star headband makes a great everyday alternative to Sage’s tiara. The constellation earrings are perfect for reminding the Starlings where they’re from while they’re granting wishes on Wish World and are feeling a little homesick. If you’re going for more of Sage’s exact style, you’ll want to pick up a long necklace with lots of stars on it. They’re not too hard to find. A galaxy necklace is really similar to her Power Crystal, Lavenderite. And really, who wouldn’t want a feathery, ombre notebook? Scarlet is a little bit shy, but she’s definitely not shy when it comes to her fashion choices. She wears lots of bright pink and black and has lots of punky edge. A striped sweater is the perfect way to replicate the highlights in her hair without having to use hair dye. Scarlet rocks a lot of boots, so we picked these really cute pink and black bow boots that we think she’d love. We’ve never seen Scarlet wear fishnets, but when we saw pink and black fishnet arm warmers, we just KNEW we had to include them. You know she’d wear those everyday if she had a pair! And of course, being a skater, we had to include a skateboard for her look! Being a chef, Tessa probably has a lot of recipes to keep track of, so a cupcake notebook or iPad case is a perfect choice. She wears a lot of Peter Pan collars, generally on her sweater, so finding a shirt or sweater with a similar type of collar will definitely bring your Tessa look to the next level. 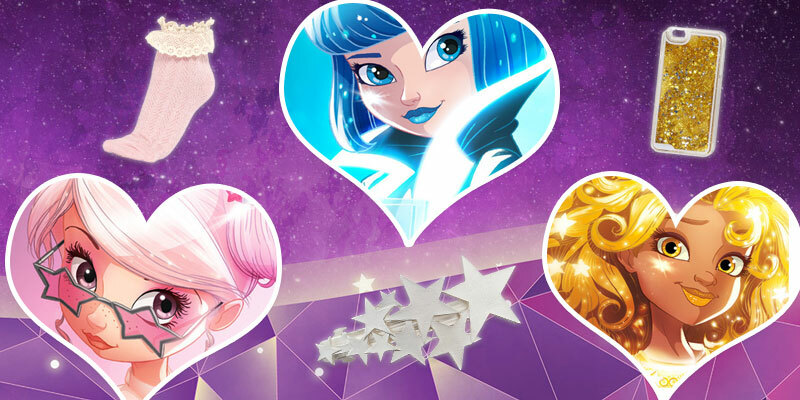 (Bonus points if you rock a glowy star brooch or necklace like she does!) Being the motherly, nurturing type, we thought a wrap scarf was a great choice for her for when she wants to comfort a friend in need. Top off her look with a pretty teal crystal necklace that matches her Charmelite, and you’ve got the look down. Now you just need to learn how to cook! Vega’s Wish Pendant is a belt, so we obviously needed to pick a belt for her accessory lookbook. (With lots of glitter to make you sparkle and glimmer just like the Starlings!) 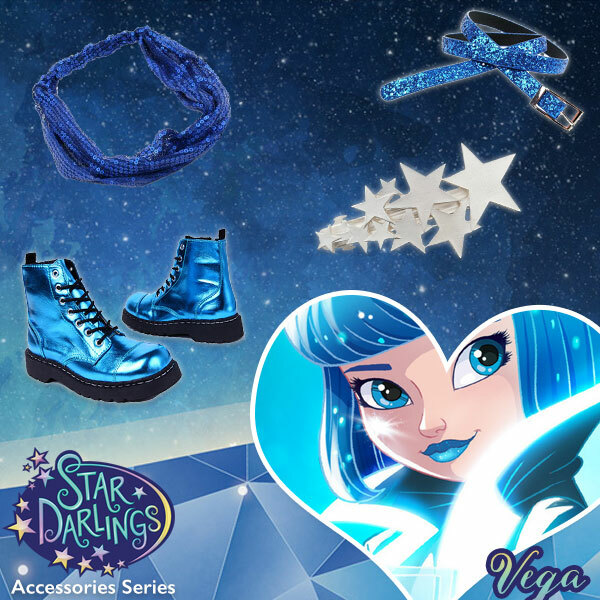 Vega wears a star cluster hairclip on one side of her cute bob haircut, and you can too! If you’re having trouble finding a cluster, we’re sure she won’t mind if you stick with a single star. She wears really awesome silver boots, too. We went with blue because they matched her shade so perfectly, but these combat boots also come in silver if you want to copy her look more exactly. The sequined scarf we picked doubles as a headwrap, and is the perfect piece to make you shimmer on the dance floor, just like Vega! 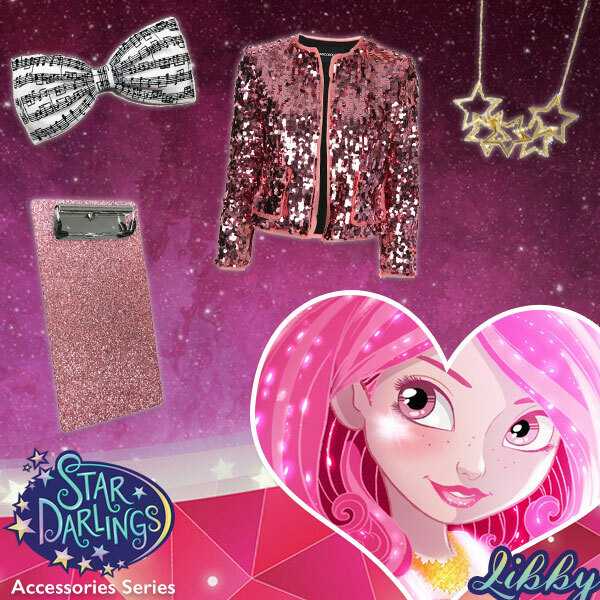 Now that you’ve perfected your Star Darlings inspired style, why not find out What Your Favorite Star Darling Says About You?